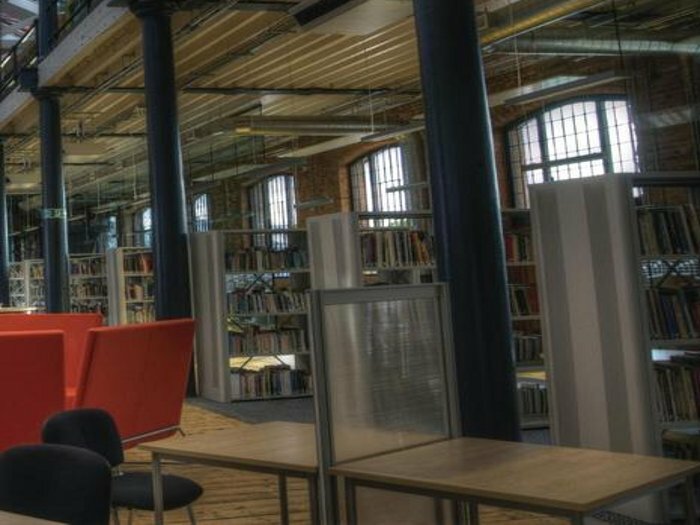 Bringing together the old and the new is one of architecture’s greatest challenges, and as East Midlands-based Maber Architects discovered with a recent project to restore and renovate Derby College’s historic Roundhouse locomotive building and its surrounding campus, getting it right can be truly rewarding. 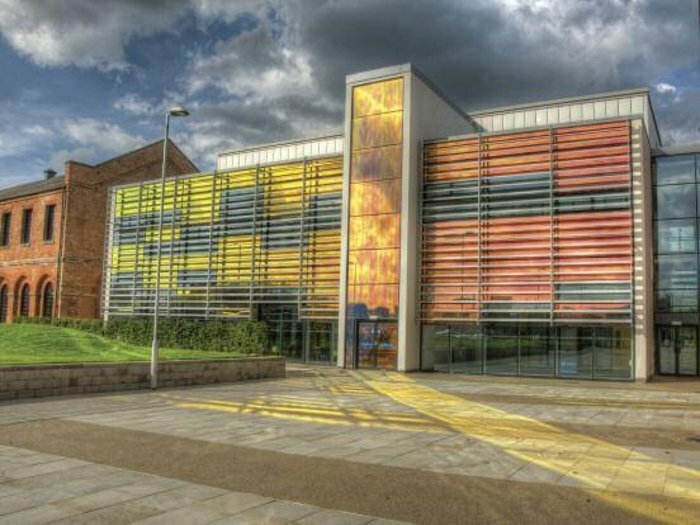 Named Project of the Year and Heritage Project of the Year at the East Midlands heat of the Construction Excellence Awards, the project was also a runner-up in the National Project of the Year award at the Centre for Constructing the Built Environment Awards. As well as transforming the 40m diameter Roundhouse building into a social hub for students and staff, Maber also created a visitors centre where the public can learn about the importance of the railway in the history of the region. The project involved restoration of the site’s historic buildings and the creation of several new ones: the Stephenson Building, named after railway engineer George Stephenson, accommodates the college’s construction, hair and beauty, and art courses; the Kirtley Building, named after the Midland Railways’ first locomotive and carriage superintendent, Matthew Kirtley, houses the engineering department, and the Francis Thompson Building, named after the original architect of the site, provides offices. 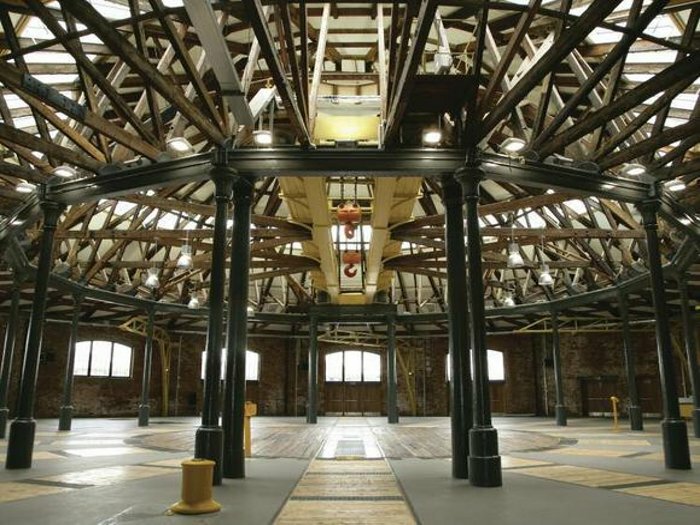 The Grade II listed Roundhouse was designed by architect Francis Thompson in association with engineer Robert Stephenson (George’s son), and built in 1839, making it and its contemporary buildings probably the oldest railway workshops in existence. Aspects of the buildings’ past have been subtly integrated into the signage, graphics and information technology, as well as informing the colour palette and the choice of carpets. Materials and objects found on site, in what Christopher Radcliffe, of Maber’s interiors division, describes as a process akin to an archeological dig, inspired the new colours: reds and oranges from bricks; yellow from lifting-cranes and other machinery; greys from architectural stone and steel paraphernalia associated with the site and from the elegant cast-iron window frames, and others taken directly from the railway company liveries. The Roundhouse is entered through a corridor. To instill a sense of drama, a life-size front view of a Kirtley 158A locomotive has been reproduced in contemporary graphic style and applied to the glass entrance doors. The transparent image looks like a ghost train, a reminder of the building’s past while giving a view into the newly renovated interior, says Radcliffe. 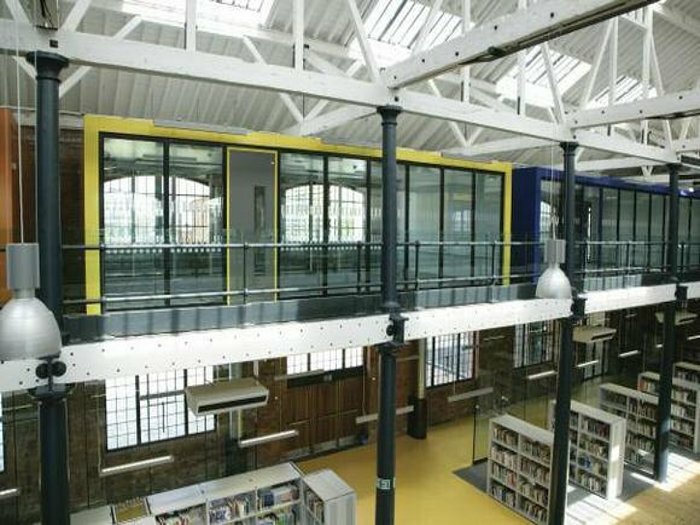 What was once a carriage repair shop has been transformed into a library, learning resources centre, and a multipurpose theatre. A 5m-high glass wall, separating the centre from the rest of the building, carries a graphic of musical notation, and this too is a link back to the era of steam locomotion: ‘The score is The Steam Train, and was probably composed early in the 19th century,’ says Radcliffe. Inside the centre is a new interior ’pod’ (the name is an amalgamation of ‘prefabricated modular units’), housing its support team. An early photograph of Kirtley, with fellow railway engineers and officials, has been applied to the part-glazed, part-solid wall. Carpet was chosen for study areas for quietness; its pattern is one of typed text on pieces of torn paper on a charcoal grey surface to represent books and learning. 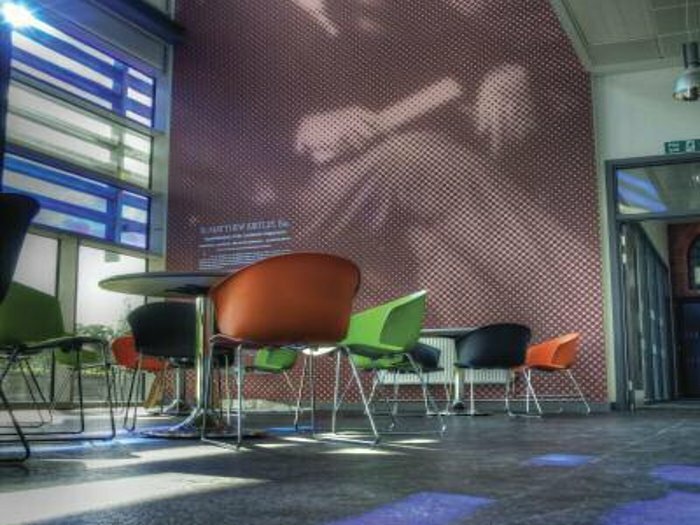 This contrasts with the bright yellow vinyl flooring of the entrance, whose digital square dot-matrix display pattern in orange is evocative of IT and new ways of learning. Original elements, such as the exposed brick, roof and floor trusses, and cast-iron window frames, have been rejuvenated, and original floorboards satisfy English Heritage requirements. With its facade coated in colourful dichroic film, the Kirtley building is, Radcliffe says, ‘unashamedly modern’. Inside, a two storey-high image of Kirtley has been made into a ‘super graphic’, a process that reproduces photographs in pixilated colours and tones, seen clearly from a distance but, up close, resembling an abstract pattern. Viewed very close, the image reveals other layers of information, such as text. The daylight which floods this area is coloured by the dichroic film of the building’s facade. The new Stephenson Building is the largest single structure on the site at 4,700 sq m. Inside, an image of George Stephenson, the inventor of the Rocket locomotive, has been made into a three storey- high ‘super graphic’ in brick-red tones to echo those of the heritage buildings. From the third floor, the giant head of Stephenson appears to look out over the older buildings where the grand locomotives would have been built.